Simple module to detect edges using the Canny algorithm from OpenCV. Compute edges in an image using the Canny edge detection algorithm. This module is intended as a pre-processor, delivering edge maps to a host computer, which may then be in charge of further processing them, for example to detect objects of various shapes. 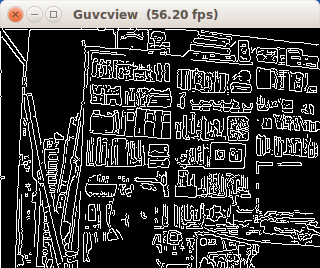 You should be able to run this module at 60 frames/s with resolution 320x240 on the JeVois camera.